Product #18576 | SKU THRS | 0.0 (no ratings yet) Thanks for your rating! This Paralinx Tomahawk Receiver is configured to be paired with a Tomahawk SDI transmitter, sold separately. 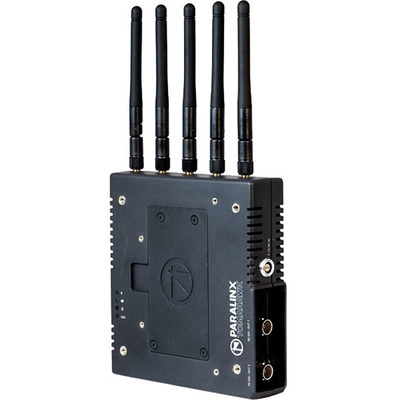 It wirelessly accepts up to 1080p60 4:2:2 uncompressed video with audio from up to 2000'(610 m) away, with a delay of less than 1 ms. Longer distances can be achieved using any optional higher-range antennas with compatible RP-SMA connectors. The Tomahawk Receiver features two 3G-SDI outputs allowing direct connection to professional broadcast monitors. The Tomahawk system operates on the licence-free 5 GHz frequency band and uses secure 128-bit AES encryption. The receiver has a 2-pin power connector input supporting 7-17 VDC unregulated input and also offers a mounting pattern for Gold mount male/female battery plates and V-mount male plates.